My brother was scouting airfare to Omaha. It's all I could do to say no, but too much is going on at work. Grrrrrr. Anyway, The AJC brings a list of what to watch for at the College World Series. While the Athens Paper brings us an article about Hitting on All Cylinders. The article talks about Perno bringing on Doug Sisson as the Bulldog hitting coach during the offseason. And Rivals.com tells us that the Dawgs know what to expect in Omaha. (Tech's) football team claims four national championships, but no Tech team has won an NCAA title. The men's basketball team came as close as any before falling to UConn in the 2004 final. 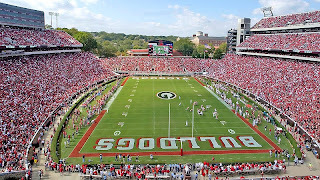 Georgia owns 24 NCAA titles, including the 1990 one in baseball.